Login to Admin Control Panel as Superuser. Go to Actions column and mark the check boxes corresponding to language(s) you need to assign to the translator. Checkboxes are disabled for languages that are already assigned to some translator. 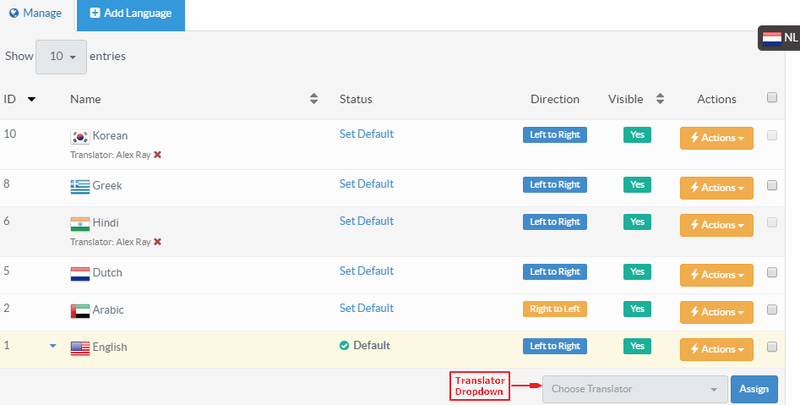 Select the translator from Translator Dropdown list and then click on "Assign" button. Note that you can select single translator at a time. The drop-down list contains the username and email address of the translators. Click on "Yes, revoke rights" button to withdraw the rights or you can click on "Cancel" button to abolish the process.